356th day of the year. There were then 9 days left in 2018. 2nd day of Winter. There were 88 days left till Spring. It's the anniversary of the GOP tax bill. The President called it “a bill for the middle class.” So how's it going? U.S. companies announced over $400bn in stock buybacks. The Dow is down 2000 points. GM is laying off 14,000 workers. And your pay raise was lost in the mail. 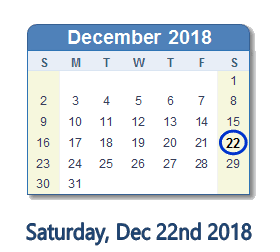 What happened on December 22nd 2018? If the government shuts down, Chef José Andrés will feed employees "until they get paid!"